The strategy for coastal and offshore security has been articulated in the document “Ensuring Secure Seas: Indian Maritime Security Strategy” of the Indian Navy. The strategy envisages ‘to reduce, counter and eliminate the threat of armed attack by sub-conventional groups, and also influx of arms and infiltration by armed attackers from the sea, against coastal and offshore assets’. The chapter “Strategy for Conflict’ covers the actions for coastal and offshore defense. Essentially the operations will be carried out by the Indian Navy in synergy with the Indian Army, Air Force, Coast Guard, and other security agencies. Defending India’s Coast, Offshore Assets, EEZ and Island Territories. India has a formidable naval force with both blue water and littoral capabilities; it also has a credible Coast guard, which would work in unison with the Indian Navy in times of war. Further India has put in place a powerful template for marine domain awareness, intelligence and protection of the coastal and offshore areas, in the aftermath of the terrorist attack of 26 Nov 2008. Some of the measures include; setting up of Multi Agency Centres (MAC) for intelligence inputs and reports; registration of fishing vessels by states; placing in orbit Indian Regional Navigation Seven Satellite System and satellite GSAT 7 ; setting up of a coast wide radar chain; raising Marine Police force, Marine Commandos Rapid Reaction Force and a Sagar Prahari Bal (SPB);setting up layered patrolling; putting in place The National Command Control Communication and Intelligence network (NC3IN) etc. Thus, the layered defence of Indian coast and its offshore areas consists of Indian Navy, the coast guard, the marine commando & Sagar Prahari Bal (SPB) and the marine police. All these are info-linked for maximum advance knowledge and in a way form a net worked coalition. However, there apparently is a gap as far as setting up the coastal and offshore area defences per se is concerned. It lacks the delay, denial, disruption, and demoralizing (D4) capability, which is essential in today’s environment. This capability should be acquired by leveraging the perceived threats presented by the submarine, mines, small craft and cruise missiles. · Seaward- the area from the shore to the open ocean, which must be defended to thwart expeditionary forces at sea. · Landward- from the shore to the area inland that can be supported and defended directly from the shore. · Comprehensive assessment of threats from expeditionary forces to ports/ harbors. · Procurement of midget/ miniature submarines with torpedoes and mine laying capability along with arrays of underwater sensors for environment, intrusion information, navigation and communication. · Procurement of UAVs/USVs with intelligent software for remote operations as swarms. · Procurement of Unmanned Underwater Sensor and Weapon Carriers capable of transmitting integrated underwater picture to fixed or mobile stations, firing torpedoes and laying mines. · Procurement and laying of cable controlled mine fields, other mine fields across various depths zones. · Coastal extended reach anti ship cruise missile batteries. · Coastal gun batteries with ability to carry out precision attack on surface ships at ranges greater than 50 km. · All systems networked for an ironclad protection of the Indian Coast and offshore assets and territories. · Development of systems for collection of oceanographic information. A robust Indian coastal and offshore defense plan and its implementation is an essential element of economic wellbeing of India, as it would ensure security of sea trade, shipping, fishing, marine resources, and offshore assets as well as security of the EEZ. Within its EEZ, a coastal state has sovereign rights for exploring, exploiting, conserving, and managing natural living and non-living resources of the waters superjacent to the seabed and its sub soil. Further, it can exploit and explore production of energy from water, winds, and currents. The EEZ remains an open zone with freedom of innocent passage for all. The EEZ legal regime is different from that governing territorial waters and high seas, and contains certain characteristics of both. However, in a recent judgment regarding the Enrica Lexie (Italian marines) case, the Supreme Court of India has declared the region between the contiguous zone and the 200 nautical miles in to the sea as ‘High Seas’. The Supreme court has said that Article 97 of the United Nations Convention on Law of the Sea (UNCLOS) is not applicable as shooting was a criminal action and not a navigation accident. China has been maintaining its right to regulate foreign military activities in its EEZ, as it feels that it has the right to prevent any activity that threatens its economic interests or security. It also asserts that its domestic laws have jurisdiction in its EEZ. The Chinese law requires foreign entities to obtain prior approval to carryout resource exploitation, fishing, and marine research. As far as military activities are concerned, it holds them as prejudicial to ‘peaceful purposes’ provision of the Laws of the Seas Convention. This interpretation has led to a number of minor standoffs between it and the United States of America. India is also one of the countries, which mandate prior permission before any maintenance, or repairs are carried out to the submarine cables running on the floor of its EEZ. With respect to military activities by foreign militaries in the EEZ, India along with Bangladesh, Brazil, Cape Verde, Malaysia, Pakistan, and Uruguay require obtaining of prior permission. North Korea has prohibited any such activity within 50 nm of its territory and Iran has completely prohibited the same. As far as oceanographic surveying is considered, again some countries require prior permission, in fact, China registered protests against the activities of USNS Bowditch and India against HMS Scott and USNS Bowditch, which were gathering military data by undertaking oceanographic survey. Coupling the above with increased proliferation of submarines in the region, the instances of clandestine underwater and ASW surveys would only increase. There are bound to be incidents involving intruder submarines in future and states would therefore be monitoring activities in their EEZs diligently. Two essential components of effective EEZ security management comprise of surveillance and deterrence. Some of the drawbacks of EEZ surveillance systems in use today include; inability of patrol boats to carry out surveillance, since their missions are area denial, SAR or interdiction; UAV’s have much better sensor packages but need a large infrastructure for 24/7 surveillance; HF radars are affordable but need very large areas for installation; Microwave radars suffer from limited horizon; and patrol aircraft incur huge costs. Since radars have difficulty in automatically identifying unknown and devious small vessels and the electro optic systems are heavily weather dependent, there is requirement for add on sensors to carry out effective monitoring of EEZ. In fact, a complete EEZ surveillance system should be able to cater to all the facets of EEZ activity be it , terrorism, drug and human trafficking, piracy, smuggling, coastal security, Search and rescue, sea traffic control, pollution control, illegal fishing, illegal arms supply and exploitation of natural resources of solar, air, wave, minerals, oil and gas. For such an extensive requirement a cooperative, synergetic and system of systems approach between various agencies involved would be paramount. · Unmanned undersea vehicles, sonar arrays, patrol submarines, and other under water sensors. · Remotely operated vehicles, unmanned surface vehicles, offshore platforms, sensors for activity monitoring, and patrol boats. · Vessel Traffic Management System (VTMS), communication networks, control centers, pollution monitoring centers, surface and navigation radars, and electro-optic systems. · Unmanned Ariel Vehicles, patrol aircraft, helicopters, aerostats, and sensors. · Observation and communication satellites. Coming to the deterrence capability in the EEZ, it has to be a non-military option during peacetime, which brings the discussion to deployment of Non Lethal Weapons (NLW) and the need to develop them for the EEZ environment. Conflicts in the EEZ are definitely going to be unconventional and it would be difficult to distinguish the adversary from the neutrals or friendly vessels. This may lead to conflicts where use of lethal weapons may not be permissible. Non-lethal weapons would provide tactical as well as strategic benefits to the EEZ protection force in the global commons. NLW would enable options for de-escalation of conflicts, avoid irretrievable consequences of using lethal options, and result in deterring activity without loss of lives and damage to material. NLWs have to be cost effective and easy to operate, as different varieties in varying numbers would be required. However to ensure a calibrated approach, across the spectrum of conflict, there is also a need for NLWs to be doctrinally integrated with the regular naval forces to enable them to tackle a developing situation in the EEZ. · From the Sea- from the sea by warships and submarines in case, an incursion has already been made on an unprotected/ inadequately protected island. As well as drawing from offensive infrastructure at the islands in the vicinity. The surveillance and defense components have to be drawn from the coastal and EEZ defense plans and augmented by use of warships and submarines at sea. The Lakshadweep islands lie between 8° – 12 °3′ N latitude and 71°E – 74°E longitude about 225 to 450 km from the Coast of Kerala. There are 12 atolls, 3 reefs, and five submerged banks. In all, there are 36 Islands, with a total land area of 32 sq km; Lakshadweep islands have a lagoon area of 4200 sq km and 20,000 sq km of territorial waters. It provides a large swath of 4, 00,000 sq km of Exclusive Economic Zone. Minicoy is the southernmost island in the Lakshadweep. It lies between 8° 15’ to 8° 20’ N and 73° 01’ to 73° 05 E with an area of 4.4 sq km including the Viringli islet. Minicoy is separated from the rest of Lakshadweep by the nine-degree channel and from the Maldives by the 8° channel. It is an independent oceanic island that does not belong to either the Maldives or the Lakshadweep bank. It is located at 10°05′N 72°17′E / 10.083°N 72.283°E / 10.083; 72.283, 52 km to the SW of Kavaratti, 76 km to the south of Agatti, 139 km to the west of Kalpeni and 205 km to the NNW of Minicoy, with the broad Nine Degree Channel between them. There are two uninhabited islands, Valiyakara at the northern end with a lighthouse ARLHS LAK-015, and Cheriyakara on the southeastern side. These two islands have a long sandbank Suheli Pitti between them. · Socioeconomic Dimensions And Action Plan For Conservation Of Coastal Resources Based On An Understanding Of Anthropogenic Threats. Minicoy Island – UT Of Lakshadweep Project Supervisor: Vineeta Hoon. Centre for Action Research on Environment Science & Society, Chennai. 2003. · Report on BSLLD (Urban) Pilot in Lakshdweep, 2014. Directorate of Planning and Statistics, Lakshadweep. · CZMAs and Coastal Environments- Two Decades of Regulating Land Use Change on India’s Coastline. Center for Policy Research, 2015. · Integrated Island Management Plan (IIMP) for Minicoy island. Minicoy and Suheli Par would synergistic-ally straddle the 9-degree channel, one of the most important SLOC not only for India, but also for the Indo-Pacific region and also for China. 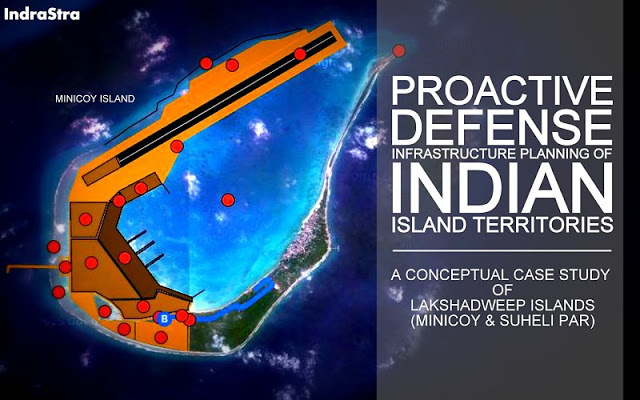 The security of the SLOC would be ensured pro-actively by developing the defense structure at both islands. · Minicoy is inhabited and Suheli Par is not, thus providing two distinct classes of islands. · Minicoy is geologically different from other islands in the Lakshadweep. · Both have large lagoons. · Both need to be developed for prosperity and connectivity of the region with main land. · Both have poor connectivity with mainland. · Main Features of Proactive Defense of Islands. · Airstrips for use by tourists as well as defense. It is important that any academic exercise for development of a proactive defense infrastructure of island territories consider concepts of Maritime Domain Awareness (MDA), Oceanic Domain Awareness (ODA), and Ocean Information Consciousness Zones (OICZ). MDA focuses upon the maritime security environment specific to naval operations; the ODA focuses upon the overarching oceanic environment. Both are technology intensive and require sophisticated sensors and computational capabilities.MDA has tactical, regional, and strategic components whereas the ODA is strategic knowledge based architecture. Both require elaborate data and information fusing interface with myriad of interconnected agencies. The MDA primarily needing vast inputs from commercial, intelligence and security agencies and the ODA from advanced research, academic and scientific communities. The ODA is conceptualized as a comprehensive 3D+ knowledge zone up to India’s EEZ, the OICZ on the other hand is a collaborative approach at sharing oceanic information, processing it as required and archiving it for use at a later date. ODA can be established by a country individually, but OICZ requires transfer / sharing of scientific knowledge and technology between nations. Benefits of ODA accrue to the nation whereas OICZ would empower the region. Both are strategic in nature. In the field of geopolitical studies, spatial analysis driven by various geographic information system (GIS) technologies helps strategic experts in computing required and desired solutions. In this analysis of Minicoy Island and Suheli Par, Google My Map API is used to perform a variety of geo-spatial calculations by using a set of easy to use function calls in the data step. In layman’s term, a layer-by-layer computational analysis of geographic patterns to finding optimum routes, site selection, and advanced predictive modeling to substantiate this analysis has been carried out. These concepts are formulated by considering the land reclamation factors and available details of Integrated Island Management Plan of Government of India (GoI) for Lakshadweep Islands. However, there are certain limitations associated with this analysis with respect to bathymetric data, which has not been considered for evaluation purpose due to lack of availability of such data in open/public domain. Further, these interactive custom maps can be easily exported into KMZ format and can also be embedded seamlessly with other websites for further distribution. Considering all the factors discussed hitherto the maps are embedded in this article, depicting the proactive defense infrastructure plan for Minicoy and Suheli Par have been developed. India’s EEZ and island territories face threats of disruption of energy supplies, piracy, and acts of terrorism, in addition to the fact that other nations are keen to poach in to the fisheries and seabed wealth. The security of the EEZ and island territories is therefore a matter of India’s national interest and need exists for boosting the surveillance and augmenting security arrangements of EEZ’s and island territories. Even though, an ambitious plan for coastal security and maritime domain awareness has been put in place, it needs to be further strengthened and stitched together so that the security of EEZ and Island territories functions as a comprehensive entity with synergies across the various agencies involved. The academic exercise undertaken above in respect of Minicoy and Suheli Par islands demonstrates that it is feasible to provide effective SLOC protection, achieve maritime dominance in a limited area of interest, provide support to second strike capability and utilize space and oceans for surveillance, intelligence, science, and communications purposes. Time for a proactive approach to plan the defense of EEZ and island territories is now! Rear Admiral Dr S. Kulshrestha: The author RADM Dr. S. Kulshrestha (Retd. ), INDIAN NAVY, holds expertise in quality assurance of naval armament and ammunition. He is an alumnus of the NDC and a PhD from JNU. He superannuated from the post of Dir General Naval Armament Inspection in 2011. He is unaffiliated and writes in defence journals on issues related to Armament technology and indigenisation. 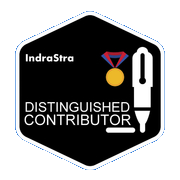 Rahul Guhathakurta: He is the founder of IndraStra Global and a seasoned supply chain management professional with 8+ years experience in trade route optimization and planning through various GIS applications.